Working in collaboration with directors and production designers, set decorators are key members of the design team for film and television, tasked with converting the blank canvas of the set into a space that feels authentic and believable. They must research, resource, and acquire all of the objects required to dress the sets — from interior items like furniture, drapery, and knickknacks to exterior elements such as street lamps, trashcans, or rubble and debris. Andrew Jackness, film production designer, will lead a discussion with prominent set decorators George DeTitta, SDSA, Birdman (2014); Regina Graves, SDSA, The Knick(Cinemax); and David Schlesinger, SDSA, Annie (2014), about their work and creative process, from preparation to dressing and shooting the sets. 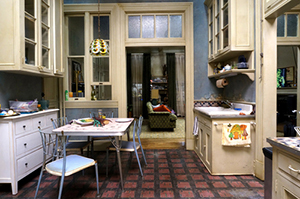 This event is programmed in conjunction with the Set Decorators Society of America.